A radiograph of Darwinius masillae, aka "Ida"
It was the fossil infamously hyped as the scientific discovery “THAT WILL CHANGE EVERYTHING.” But one year after its controversial press conference debut, Darwinius masillae has come under increased scrutiny from a scientific community already skeptical about the 55-million-year-old primate fossil’s Hollywood roll-out. When scientists from Norway, Germany and Michigan published the original Darwinius paper (oh, and also released a book and a TV show), they argued that the tiny, lemur-like Ida was the earliest known primate ancestor of humans. But in October, a paper in the journal Nature used computer analysis of Darwinius’ physical features to place it about as far away from humans as possible on the primate evolutionary tree. Last week, another blow was struck against the claim of Darwinius as an ancestor of humanity, this time in a direct reply to the original paper that was published in the Journal of Human Evolution. The JHE paper is a straightforward, business-like rebuttal that dissects the arguments used to place Darwinius in the lineage that eventually begat humans, employing additional anatomical evidence to reverse the original conclusions. But no punches were pulled by Callum Ross, one of four authors of the reply paper and a scientist already on record calling the original article “a travesty,” in our conversation about the controversy. Ross emphasized that he does not question the scientific integrity of the authors who originally described Darwinius, even commending them for a “great” description of the specimen. But it’s their interpretation of that description, and their placement of Darwinius in the phylogenetic “tree of life,” that Ross has quarrel with – an analysis based on cherry-picking anatomical features. The debate over where to categorize Darwinius comes down to two options. In one scenario (preferred by the original authors), the creature is a haplorhine, a predecessor of monkeys, apes, and the hairless apes called humans. 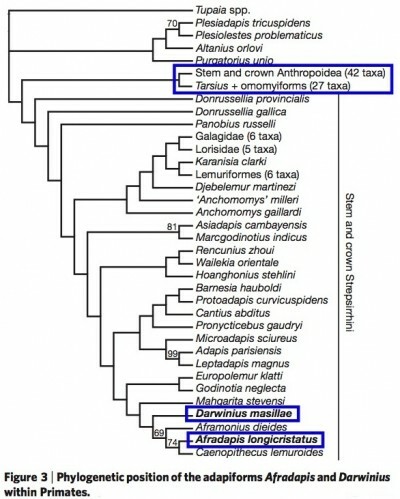 In the other case, Darwinius is a strepsirrhine, meaning the lemur-like animal was a distant ancestor of…lemurs. Ross and colleagues support the latter placement, which is in keeping with how a majority of anthropologists have filed previously-described fossils similar to Darwinius. In the original paper (published in the open-access journal PLoS One), the authors used 30 different characteristics of the fossil, such as snout length and dental features, to categorize Darwinius as a haplorhine. But Ross said that there are currently more than 300 physical characteristics established for comparing early primate fossils, and when he and his colleagues analyzed those other 270+ features in addition to the original 30, the conclusion went the opposite direction. So why would such a hyperbolic media campaign be waged over such shaky science? Ross said the cynical conclusion would be that the Natural History Museum of Norway, which purchased the missing piece that completed Darwinius for a reported $1 million, needed to recoup its expenses. It’s also a good argument for skepticism in science media, where reactions to the Darwinius announcement ranged from suspicion and proper perspective to naive parroting of the press push. Some science writers (including our own Jeremy Manier) questioned the motives of keeping the publication of the Darwinius paper secret until after the scientists’ press conference. But Ross said that secrecy wasn’t such a concern – though he has since requested to see a high-quality cast of the fossil and was tersely rejected by one of the original authors. As a point of comparison, Ross raised Ardipithecus ramidus, the 4.4-million-year-old hominid described last fall by Tim White and colleagues in Science. Though White also declined to show his fossils to anyone but his collaborators for more than 15 years, the analysis finally published by his team was scientifically sound, Ross said.